Juliana products are only available in our Seattle store. One day on the Juliana Furtado C S+ Complete Mountain Bike is all it takes. 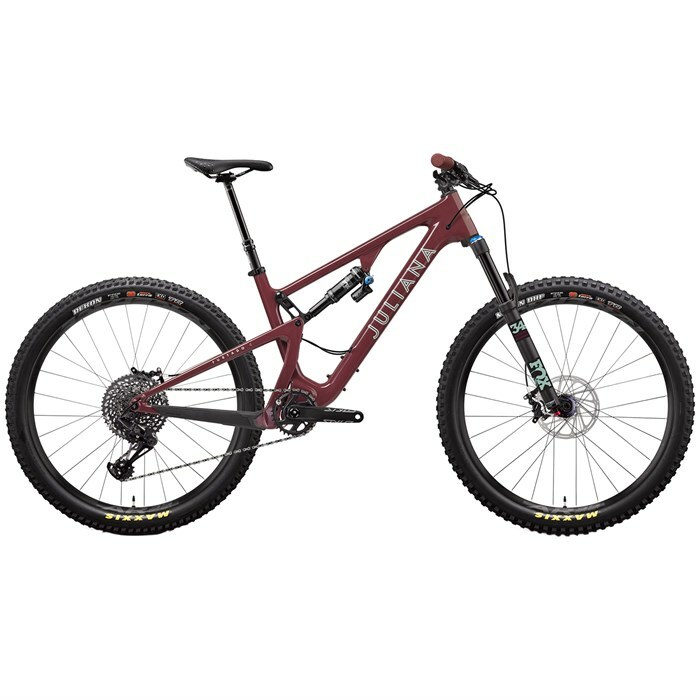 The name of the game here is balance - for 3.0, Juliana has slacked 'er out a tiny bit more, leaving the supple 130mm of upper-linked VPP® suspension intact. Spec'ed with an ultra-capable SRAM GX Eagle™ drivetrain and Fox Performance Elite suspension, this new Furtado can be enjoyed by riders of all skill levels across a huge variety of terrain. From tech gnar steep roots and rocks to long, flowing singletrack, the Furtado 3.0 is the confident, well rounded trail bike that'll put a grin on your face at every turn. 130mm VPP® Suspension  VPP is based on the patented principle of having two short links rotating in opposite directions. This system provides huge design flexibility, allowing Santa Cruz to manipulate shock rates to the intended purpose and character of each model; from short travel endurance bikes to World Championship winning DH machines. Fox DPX2 Performance Shock  Combining the best of X2 and DPS, the DPX2 features a recirculating oil damper design with the convenience of three on-the-fly compression damping positions. Frame Update 3.0  The Furtado sees a longer reach, slightly slacker head angle and steeper seat angle for a more optimized ride. 27.5 / 27.5+ Wheel Clearance  Clearance for up to 2.8-inch tires. Fox 34 Performance Fork  Performance forks retain the same black anodized 7000 series aluminum upper tubes as Performance Elite, but have a different damper (FIT GRIP) with fewer adjustments. Maxxis Rekon | Rear Tire  The Rekon is an aggressive trail tire inspired by the Ikon for intermediate and technical terrain. Wide knobs down the middle provide control under braking and L-shaped side knobs assure support when carving loose turns. With confidence like this you can race more and scout less with the Rekon. Front Tire: Maxxis Minion DHF 3C MaxxTerra EXO TR | 27.5 x 2.6"
Rear Tire: Maxxis Rekon 3C MaxxTerra EXO TR | 27.5 x 2.6"